Increase safety and greatly improve the appearance of worn and weathered steps and staircases with Koffler''s Anti-slip Indoor / Outdoor Stair Treads. Easy to install with standard woodworking tools, these stair treads feature fiberglass reinforced composite construction that is compression molded, delivering a homogenous and consistent tread. These highly durable anti-slip step covers are resistant to most chemicals, salt water, and extreme temperatures. Treads can even be submerged and installed under water! 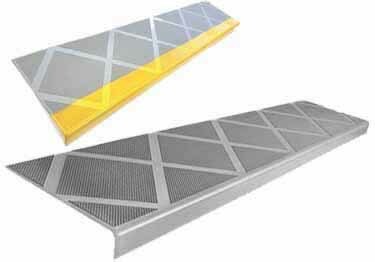 Low maintenance step cover treads come in molded color options of grey or beige in 48" lengths. Reinforced composite construction - thermoset plastic, polyester resin and fiberglass reinforced so it is homogenous and consistent, color is molded in. Will not distort with extreme temperatures. It is durable, rigid and robust. Easily installed to structural sound wooden, concrete and steel steps and stair cases. Can these be cut to the size of your steps and, if so, what type of tool would be best? Are these barefoot friendly. Will they work at our beach house. I am wondering what kind of mastic is required for adhering composite stair treads. What is the coverage? Thank you. Extremely durable product, easy to install. Has superior traction. Understand product is paintable, although it would be more preferred if more resin colors were available for purchase. Thank you for the review. We appreciate your feedback about the ease of installation and your suggestion about additional colors. We are in the process of discussing the possibility down the road of additional resin colors.